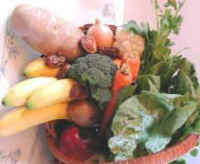 Vegetarian diets also help prevent heart disease. Animal products are the main source of saturated fat and the only source of cholesterol in the diet. Vegetarians avoid these risky products. Additionally, fiber helps reduce cholesterol levels, and animal products contain no fiber. One study even demonstrated that a low-fat, high-fiber, vegetarian diet combined with stress reduction techniques, smoking cessation, and exercise could actually reverse atherosclerosis—hardening of the arteries. Heart diets that include animal products are much less effective, usually only slowing the process of atherosclerosis. Back in the early 1900s, nutritionists noted that people who ate no meat had lower blood pressure. It was also discovered that vegetarian diets could, within two weeks, significantly reduce a person’s blood pressure. These results were evident regardless of the sodium levels in the vegetarian diets. 1. Sacks FM, Castelli WP, Donner A, Kass EH. Plasma lipids and lipoproteins in vegetarians and controls. N Engl J Med 1975;292:1148-52. 2. Ornish D, Brown SE, Scherwitz LW. Can lifestyle changes reverse coronary heart disease? Lancet 1990;336:129-33. 3. Salie F. Influence of vegetarian food on blood pressure. Med Klin 1930;26:929-31. 4. Donaldson AN. The relation of protein foods to hypertension. Calif West Med 1926;24:328-31.